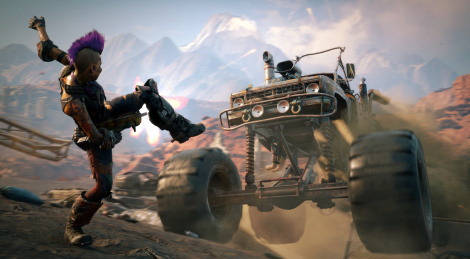 The first in-game footage of RAGE 2 are revealed today with the titl's first gamepaly trailer and screens. The game, developed by id Software and Avalanche Studios, the game will release in Spring 2019. More will be revealed during the BE3 Showcase on June 10 but you can also learn more now about the open dystopian world and the game's features in a new blog post at Bethesda's site. Looks good, i want to see more at e3. Is it me or did that melee animation not look exactly like the warlocks melee from destiny? Really loving the art style, gameplay, the characters and enemies' designs, the weapons, even the music is getting better the more I hear it. They even kept the art style of the original Rage and improved the boomerang mechanic - after seeing it, I realized how much I've missed it since 2011. The gameplay mechanics of the first game, which are already stellar, just got even better. The open-world design is really great for Rage 2, something the first game sorely lacked. This feels so much more like a "Post-Apocalyptic Fallout/The Elder Scrolls Mad Max style" FPS with "Doom (2016) gameplay"!!! That yard scene with all the containers immediately made me think of Doom (2016), like an open-world Doom (2016)! Which is insanely promising. I need to see more like a proper gameplay session, but so far everything I've seen has put a very big wide smile on my face. This feels like a proper and more serious take - while retaining some humour - on the what Borderlands was trying to achieve, but never really did it. With Avalanche Studios in cooperation with id Software at the helm, gameplay and atmosphere will come first above everything. 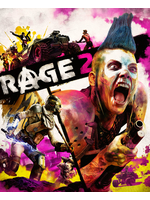 Rage 2 has jumped to the top 3 of my most anticipated games for the foreseeable future - after Red Dead Redemption 2 and Shadow of the Tomb Raider. Can't wait to see more at E3 2018.
it looks surprisingly decent. the marketing thankfully doesn't seem to be have much to do with the actual game. do need to see more though because the first game looked good initially too and that turned out boring as hell. Awful music, but the game could be good. I found the music awful at first, specially in the announcement trailer, but after listening to it for a while and watching all the mayhem and chaos unfolding in the gameplay trailer, it started growing on me. Seems like they're going for a Punk-Rock mixed with Heavy Metal style of music for the fight scenes, similar to what Doom (2016) does with Heavy Metal music during fights. Which work exceptionally well for Doom (2016), hopefully this does the same for Rage 2. Though because of the very heavy and unique Punk art style and music, I'm sure it will be a very divisive game - people will either love it to death or hate it to death. Nice, the main team of Avalanche already have some experience with this type of game. Probably id are working on the shooting mechanics, while the Avalanche on game world etc. The game could be pleasant surprise at the end. Looks great, it's RAGE+DOOM how can that not be great. Wasn't interested in Doom in the end for a couple of reasons, but this works. If it's open world without being too open world full of the usual mundane stuff and actually properly designed as a shooter, then this could be what the original was intended to be. They should have just shown this and ditched the awful teaser, which was pointless in the end. Wasn't interested in Doom in the end for a couple of reasons, but this works. DOOM 2016 is Id's best single player game, period. me either. combining doom with rage sounds like a horrible combo for me, but i'm hoping rage 2 isn't quite the same arena combat tedium of doom. it doesn't look like it from the trailer and it least has some car combat to break things up and add some much needed variation. as long as the world doesn't just serve as a thing to spend time travelling across like it was in rage it should be good to go. that was the biggest issue with rage, it would have been better served as a completely linear set of levels. the open world didn't add anything at all. I wonder if John Goodman will be in this one. Not saying its a bad game, Grift. Just things I didn't like from a personal point of view. Doom 2016 is one of the best FPS games ever made, but it has nothing to do with Rage 2 this is NOT made by id soft. So only link to Doom is its engine. I mean I really enjoyed it too, but I wouldn't go that far. Worst game Disc cover ever. Yesterday I said the first one was crap, this one might be good. It looks ok but the game is not developed by Id but by Avalanche Studio so my expectations are rather low (looking at their recent games). apparently it's a collaboration. id likely handling FPS combat and avalanche handling more of the open world stuff. you said avalanche were the only ones developing it. i was simply correcting you. as for what id can do with the apex engine, as you say, we'll see.